» Angled parking in downtown Albany? Angled parking in downtown Albany? Diagonal rather than parallel parking spaces might be set up on this block of Second. Angled parking may be coming to parts of downtown Albany sooner than expected. But it’s not a sure thing because ODOT may have something to say about it. The topic came up briefly Wednesday at a meeting of the Central Albany Revitalization Area advisory board. 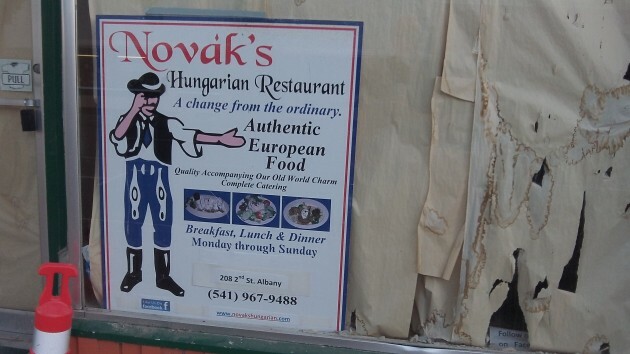 The board approved a no-interest loan of up to $175,000 to help Novak’s Hungarian Restaurant complete the renovation of the storefront at 208 Second Ave. S.W., where it plans to move from its current address off 14th Avenue S.E. The Novaks originally announced their plans in November 2013, when they got CARA’s OK for a $126,000 loan toward what they then estimated would be a $627,000 project. Five months later, in April 2014, the project estimate had risen, and CARA increased the loan amount to $200,000 and made it “forgivable,” turning it into a grant. Hopeful sign in the papered-over window at 208 Second Ave. S.W. In view of the popular restaurant moving there, without a parking lot of its own, the city’s Kate Porsche said she was thinking about angled parking replacing the parallel spaces on that side of Second for the one block between Broadalbin and Ellsworth. ODOT would be consulted, she said, and may have concerns about drivers making a right turn at the signal on Ellsworth. Before acting on the unscheduled Novak matter, the CARA board approved, with Councilor Rich Kellum voting no, a $500,000 no-interest, 20-year loan to Rick Mikesell toward a $1.2 million reconstruction of the Century Building at First and Lyon. One of the drawings of the project showed angle parking in front on First. But Ryals, the architect for that project as well, said he just drew that in because he’s a fan of diagonal parking. Because they are easier to use, he thinks, angled spaces would help downtown businesses. Angled parking on the north side of First also is being considered in front of the Albany Carousel once it expands. The possible parking changes were, to me, the most potentially interesting items Wednesday. The only other item of interest was that CARA approved a change in the aid partnership it has with Scott and Spencer Lepman, who plan to renovate the historic Fortmiller funeral parlor on Third Avenue S.W. and build townhouses next door. Zoning problems prevent them from building the townhomes, and CARA agreed to their plan to build six townhomes or eight apartments on a lot on Third Avenue S.E. instead. Also, the board agreed to fund with CARA money the hiring of a consultant to review downtown zoning language so that the city can remove obstacles of the kind that foiled the original Lepman plan. Architect Ryals is correct. 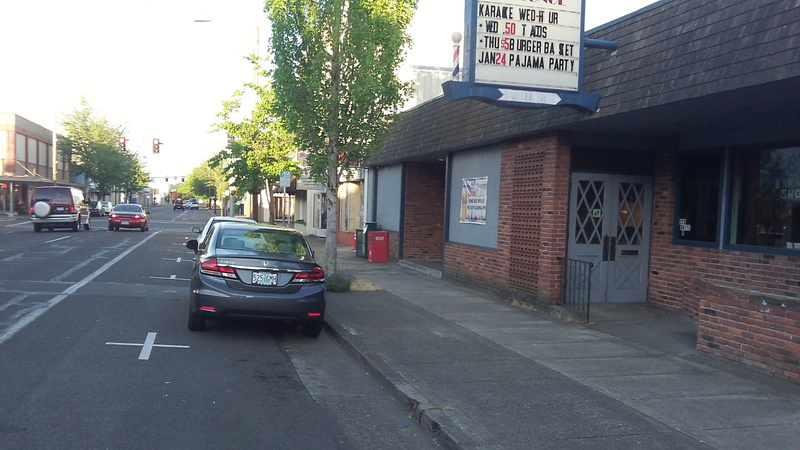 In downtown Corvallis, 2nd St. has angled parking. It works very well there and serves as a good example. I support angle parking everywhere the street has sufficient width. It is more space efficient and causes less congestion because parking takes less time as drivers behind yield to the driver parking their vehicle, not to mention it’s an easier maneuver for most drivers. I can’t see how ODOT would have an objection regarding the corner at Ellsworth but I wouldn’t be the least bit surprised if they dream up some reason why it’s not a good idea. I have made suggestions to ODOT before (Granger Road @ Hwy 20 intersection) and was roundly shot down in flames when they said my idea wouldn’t work there, when clearly it would have been a marked improvement to the dangerous situation that STILL exists there (and at Independence Road @ Hwy 20). Perhaps a wave of common sense will come into play here. We’ll see. Good luck on this, Kate. If we could get angled parking in downtown Albany, it would make a big difference as to how many people actually frequent downtown Albany businesses and restaurants. I don’t think parallel parking was ever a good idea, and if it is phased out where possible in the U.S., it will be a good thing.